The wav file with 20kHz sine played via foobar/DAC gives expected spectrum with no extra stuff(300kHz spectrum range on analizer). Any suggestion, folks, as I see now my brain limits ? (can not believe that it is a side aliasing component 44kHz-20kHz which is not supressed enough though). Are you certain that the digitally-recorded sine wave is correct? This could be the result of a bad zero-crossing value, ie: confusion between signed and unsigned int for ADC samples? 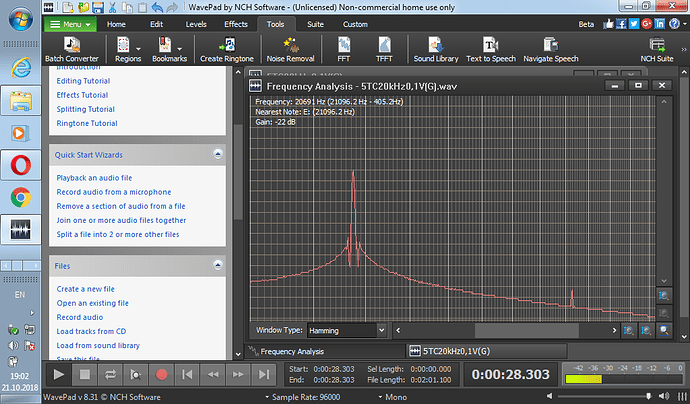 Can you view the digital sine wave in a sound editor to confirm that it is recorded correctly? p.s . the audio CD has been created by foobar. 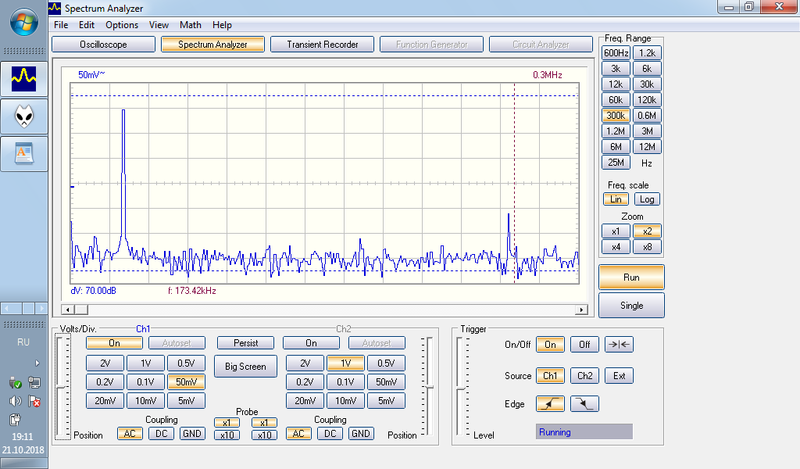 Could you share a shot of the (time-domain) waveform itself? 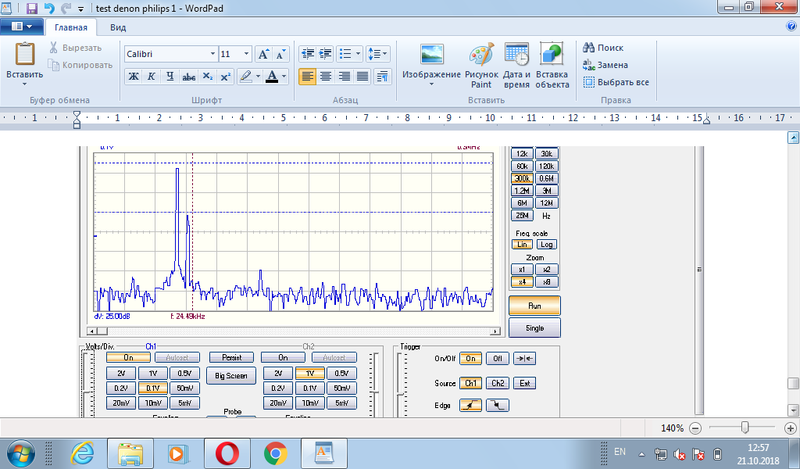 Actually, the wav(both initial and ripped back from CD) gives stable 20kHz on velleman in time domain while track played by cd player have a clear modulation, breathing so to say. Is there some reason you are convinced that this isn’t simply poor output filtering on your CD player? If the source material is good, and the recorded waveform on CD is correct, haven’t you ruled out all of the other possibilities? Looks I can close the topic down now. 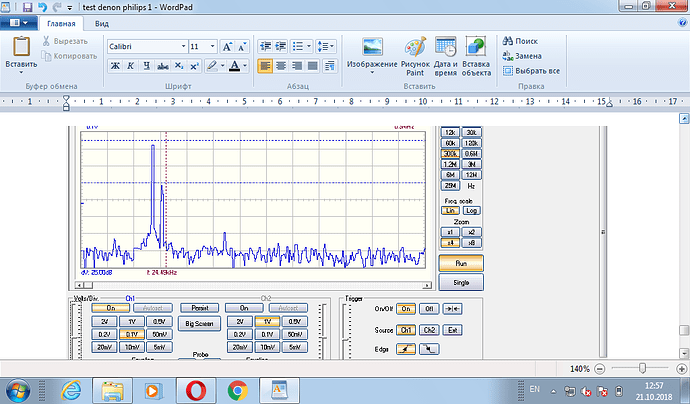 For some good reasons the signal 20kHz with THD of 2-3% when converted and resampled to 44kHz has the the small pick around 24kHz(aliasing) and that is seen on wav file in sound editor, the “clean” signal hasn’t(well, at least on noisy pc analyzer ). that makes a difference finally at cd output.